February 21, 2017, Rotterdam, was a rewarding day for HYS Enterprise, a Dutch-Ukrainian software house based in Odessa. 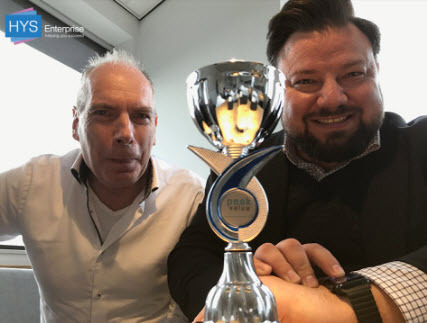 Its co-founders, Hans Uithol and Yuri Warczynski, received a Peak Value Growth Award for the fastest growing company in a competition with chosen entrepreneurs from the Netherlands. Peak Value, the holder of the contest, encourages business executives to invest in the growth of their companies by offering tools that show how to maximize their existing potential. At the Entrepreneurs Dinner, a monthly event that gathers Dutch entrepreneurs to share their success stories, Warczynski and Uithol were rewarded with a trophy. As a predictive analytical service, Peak Value introduces a picture of your company’s future, and then provides support to meet your target goals. For the team of HYS Enterprise, this trophy is the output of their dedication and hard work. Enthusiastic about the future of HYS Enterprise, Warczynski and Uithol have once again proved that high-reaching goals are attainable unless you fail to align them with your team performance. Yuri Warczynski was recognized as the best tech CEO of the 2016 Year in Ukrainian IT BIZ Awards for doubling the size of the company in 18 months. The following article dwells upon his detailed recommendations on how to manage business successfully. HYS Enterprise is a software development company with headquarters in Amsterdam, the Netherlands and office in Odessa, Ukraine. It delivers complex telecom projects, develops transport, logistics, and finance solutions, and provides other outsourcing services. Company’s portfolio – IT outsourcing projects, the Epicflow software product – a web application for managing multi-projects.